The Sunroof was Advertised as a Safety Feature! 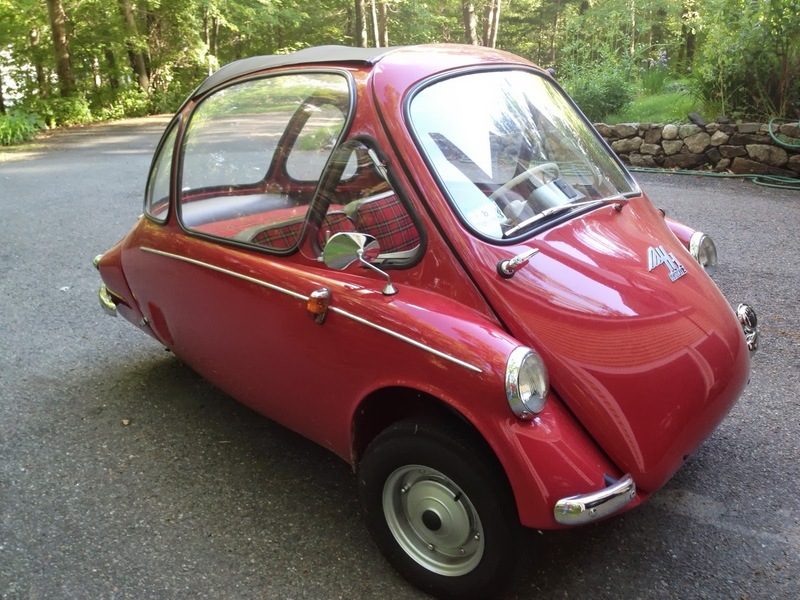 Almost every Heinkel Car ever made had a sunroof (I saw one on eBay a few years ago that didn't). The sunroof is an important part of the car; without it the car would be hot and claustrophobic. After 50 years most of these sunroofs have rotted or deteriorated to the point where they need replacement. With some basic skills and a decent sewing machine you can renew your roof. The picture above shows the basic parts of the sunroof. Starting at the left, there's a steel piece that bows the roof to shed water, an aluminum piece that attaches the rear of the roof to the body of the car, the roof itself and, attached to the roof, the actual roof hardware. Most of the work is straightforward. The bow piece is not visible unless you are inside the car. I painted mine the same color as the body. The aluminum piece should be cleaned up and readied for reuse. It was originally bare metal. Most of your work will be on the fabric roof and frame. Use care when removing the frame from the fabric roof. The front of the frame has a special gasket (available from UK club), metal retaining strip and rivets. It's best to drill out the rivets, which you can replace with standard 1/8" (3mm) pop rivets. The only exception to this are the two very end rivets, which are a bit longer and require slightly longer standard rivets. I have a few sunroofs and they were all assembled a little differently. Each one had the fabric glued to the frame, with rivets through the fabric. One did not have the gasket and metal retaining strip. Without the gasket and strip you cannot get a waterproof seal between the front of the car and roof. After you separate the roof from the frame you should rip the seams on the fabric roof and use it as a pattern for the new pieces you are going to cut. The handle is held on with a small pin which can be punched out. This piece polishes up nicely. It's worth spending a little extra time on it! The original frame appeared to be galvanized metal or painted black, depending on the sourcing of the parts. I painted mine using a hammered paint. I used about 1.5 yards of 18 oz. tonneau cover for the top. 2 small side pieces that connect the roof to the sliding supports. Sew all of the pieces using heavy duty thread. This is where it helps to have a decent sewing machine (or a friend who has one). This is a bit tricky and having someone to assist you will be a big help. The tricky part is keeping the roof straight on the frame. I used contact cement to glue the front of the fabric to the front. Once it's dry, use an awl to make holes for the rivets. Then rivet the fabric, frame, gasket and retaining strip together. Lay the roof on the car upside down, with the bulk of the roof stretched over the bubble window. Have your helpers stretch the fabric across the back of the car, and place the aluminum strip on top of the fabric. While they are holding this in place, pull the roof up and over and make sure it will reach the front of the car (you can do some fine adjustments later). Assuming you are happy with the fit, pull the roof back and use a piece of chalk to mark the exact location of the aluminum cleat and the holes where the screws will go. Now, remove the cleat and use the awl to make holes for the screws. After you've made holes for the screws, attach the aluminum cleat and fabric into their permanent position. Slide the threaded rods into the sleeves in the fabric roof. Adjust the rods to get a snug fit on the roof. Once you are happy with the fit, attach the rods to the appropriate spots on the roof. You now have a completed Heinkel convertible roof. You will find some gaps near the front if you look from the side. However, water will not leak into the car under normal circumstances. Enjoy the ride!